The mergers and acquisitions (M&As) business is booming. But deals are not without their complications. Here’s how your organization can ensure a successful transaction. 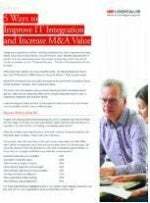 extensive experience and consulting leadership, Logicalis provides a range of services to help you successfully complete your M&A deal and derive the intended business value.